It’s very easy to buy an amazing interior design experience when the design budget looks like the gross domestic product of a small city. It’s much more challenging to create a high-quality experience that includes texture, color, lighting style and comfort when the project is constrained by a budget. This is true of most anything. Hyper-fast cars are readily available, if your budget extends well into six figures. Exquisite international air-travel experiences are readily available, if you don’t mind spending an average worker’s month’s salary on the tickets. And the best bourbon can be right at your fingertips if $100 plus bottles don’t make you blink. What happens when reality intrudes on our plans? Well that’s when we compromise. Compromise, contrary to the opinion of political pundits, isn’t hard to do. You do it every day. One $60 bottle or two $30 bottles for the month? The calculus is instant, and responsibility insists we live within our means. Does that mean we have to drink less than world-class whiskey? Here are three bottles of single barrel bourbon that each retail for under $40. All of them are very tasty and you won’t need to make any excuses about serving them. Whether in a cocktail, highball, on the rocks or sipped neat, each of these distillates is up to the task and will please the most discerning palate without breaking the bank. All of them are worthy of consideration as an addition to your liquor cabinet. Jim Beam Single Barrel pours a coppery, clear serving with mild sheeting along the sides of the glass. I think the Jim Beam is just a little more yellow/gold than the other two. This whiskey has an immediate and powerful smell. Sweet corn and a big dollop of vanilla battle with distinctly menthol and ethanol notes. The whiskey sheds some of its unrulier aspects after a dozen minutes of swirling in the glass. Barrel oak emerges from the cacophonous opening chords, along with maybe the slightest hint of crisp apple. Overall, this whiskey isn’t going to make a living on a sophisticated aromatic experience. I found it pleasing after a wait, but was turned off by its aggression when fresh out of the bottle. I refrained from tasting this whiskey until the nose had settled in, and I’m glad I did. First impressions are of a faintly sweet caramelized sugar opening note that quickly gives way to vanilla and almost a cake frosting aftertaste. There is a little bite and some harshness. There’s a robust mouthfeel and I didn’t get the same impression of peanuts that I tend to get from other expressions of Beam. There isn’t any real complexity to this bourbon. It’s not like it’s bad when served neat, it’s just not competitive with a bunch of other things I’ve had that were both more appetizing and more interesting. The most obvious competition comes from Jim Beam itself. I haven’t tried them side by side, but I recall enjoying Jim Beam Bottled-in-Bond and Jim Beam Distiller’s Cut more than this. A drop of water tames the nose of this liquor another notch, bringing brown sugar notes forward. The whiskey is significantly tamed on the palate by the addition of a drop of water, making it smoother, sweeter, and maybe a little less interesting. I’ve enjoyed Jim Beam Bottled-in-Bond (very tasty) and Distiller’s Cut (even tastier) and I think they are both better choices than this, but memories are notoriously unreliable. I had a bottle of ordinary Jim Beam White Label and I think this Single Barrel expression is better than that. But it’s clearly cut from the same fabric. I didn’t really care for the White Label, and my first impression is that I don’t really care for this whiskey either. Out of the bottle Henry McKenna is visually almost identical in color to the Jim Beam, presenting coppery clear, if just a semitone darker and redder. Sheeting on the side of the glass was accompanied by a bit more tears than the Jim Beam, perhaps indicating a more viscous nature. The Henry McKenna is much more restrained on the nose. Crème Brulee and a bit of mint morph into a vanilla and caramel sweet note. This whiskey has a little bit going on, with some elements of fresh paint, honey and a mix of ephemeral elements that make me want to explore a little more. I won’t call this sophisticated, but it’s solidly refined and civilized. On the palate this whiskey seems silkier and smoother than the Jim Beam Single Barrel. Barrel char and oak tastes have depth and staying power. There’s no cloying sweetness, but instead a steady, smooth flow of rich flavor. The finish holds on for several seconds, exhibiting traces of ethanol and black pepper. The mouthfeel is silky and light, with no oily elements. A drop of water attenuates the nose but doesn’t change the tune. If anything, it brings forward a bit of menthol. The water softens the whiskey, prolonging the finish at the of the intensity of the flavors up front. With a splash of water, and especially if served over ice, I can see this bourbon as a very approachable introduction to complex American whiskey. It’s really a very nice and easy drinker! Like the other two bottles considered here, Evan Williams Single Barrel pours a clear copper that is nearly identical in color to the others. Give the whiskey a swirl and there is ample sheeting and long tears as the viscous fluid settles back to the bottom of the glass. On the nose this expression neatly splits the difference between the Jim Beam and the Henry McKenna, offering thick vanilla and crème brule interlaced with an ethanol bite and the slightest hints of mint. Give it some time to oxidize and the ethanol fades away as caramel and creamed corn notes move forward. It’s not super complex, but there’s something happening here. Of the three whiskies considered, this one has the most enjoyable nose for me. First impressions on the sip are that this is the least sweet and most woody of the trio. That’s not to say that it’s over the top with barrel notes. It’s dry, clean and well-integrated. There is a bit of a bite with a short finish that evokes black pepper, ginger and paprika. There is complexity, but the whole package falls short in the mid-palate to finish range. The flavor profile starts beautifully and then collapses on the finish. It’s lacking the midrange sustain of the finest bourbons. This is an easy sipper. Every swallow has a little adventure. 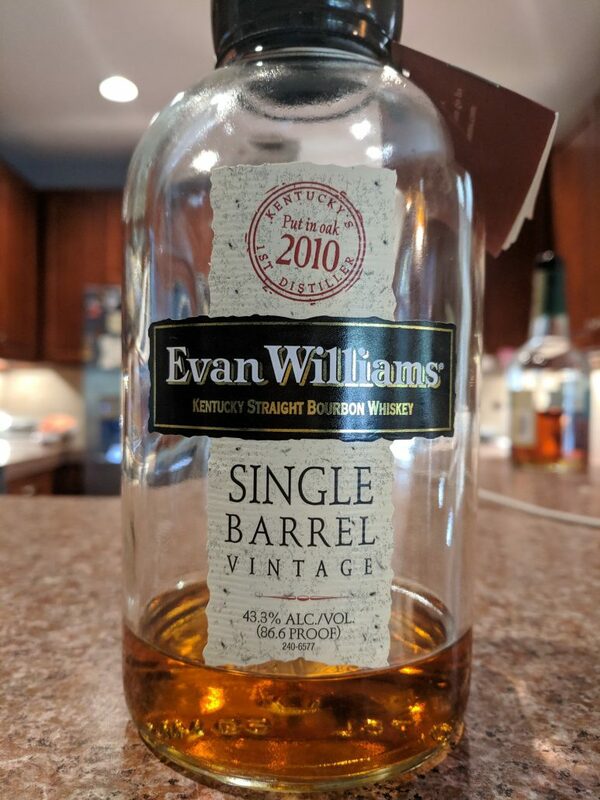 You won’t mistake this for a rarified top shelf denizen, but may immediately appreciate its level of quality and a competence that says “daily drinker!” Evan Williams Single Barrel is most definitely a cut above average. Corn and leather, pepper and baking spices – this is a very, very solid bourbon. Adding a drop of water takes the nose down a notch, taking the ethanol out and advancing the vanilla. On the taste buds the water brought the woody barrel elements a bit more forward in the mix, adding to the sense of complexity. This whiskey also drinks well on ice. It goes without saying that I like the Evan Williams more than the McKenna, which I like more than the Beam. At least I do when I have the advantage of knowing which label is poured into my glass. Let’s see how they stack up when tasted “blind”. My wife poured three measured half-ounces into identical Glen Cairn glasses and only she knew which was which. 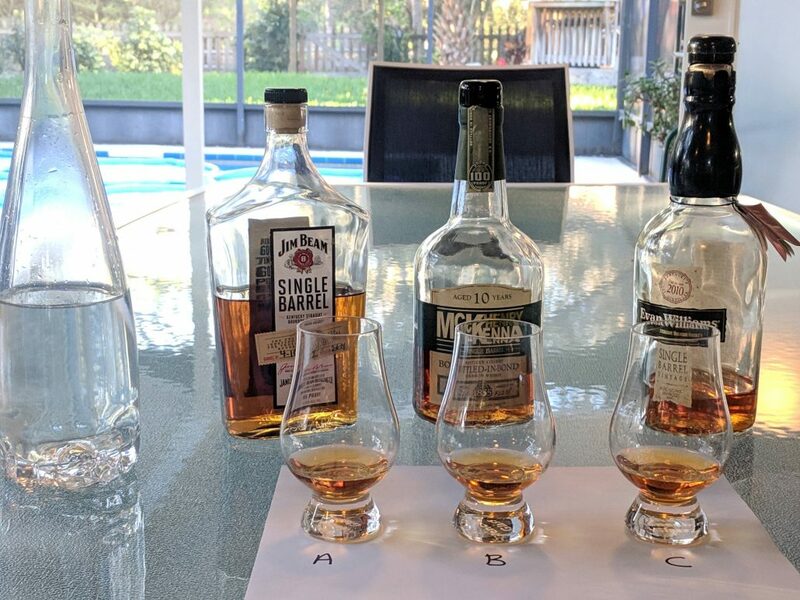 I only knew A, B, or C. All three were poured and left for about 5 minutes before I came to the set, so any initial alcohols might have a chance to evaporate out leaving the essence of the whiskey for examination. I experienced them in alphabetical order, first by nosing and then by tasting and following that with a final visit after adding a drop of water. Beautiful honey and vanilla sweet nose. A little touch of ethanol, but not prominent at all. Very approachable and from its aroma, I anticipate this will be sweet. First impressions on the tongue is a little black pepper with some alcohol burn. This is not as sweet as the nose would have you think. This is dry, and even a little intense. Oak and barrel char notes come out on the tail of the flavor profile. My guess after a first taste is this is the Henry McKenna. Adding a drop of water attenuated the nose to slight sweet vanilla and light oak wood. It tasted good, dry with a little peppery rye at the finish. I like this whiskey and I still think it’s the Henry McKenna. Regardless of label, this is a solid drinker and is my number 2 pick by a small margin. Sweet on the nose with a little more menthol than “A”. I’m getting a little fresh paint and oak barrel. It’s subtle and neither “A” nor “B” have a big impact on the taste buds, they are both solid middle-of-the-road classic bourbons. This drink is smooth and sweet on the tongue with a sweet note that stays through the finish. It seems to turn a little bitter at the back end of the flavor profile. There is an oaky barrel note that quickly fades, leaving a creamed corn sweetness with just a bit of black pepper at the back of the throat. From there it has a long finish, but not one I’m enjoying as much as I’d hoped as it’s something of a one-note affair. My guess after a first taste is that this is the Jim Beam Single Barrel. Adding a drop of water brings the paint odor a bit farther forward. It’s not an unpleasant smell, but there’s something of a “manufactured” note. It’s not sweet on the tongue but it leaves a lot of a woody note. The pepper finish is attenuated and there is a bitter aftertaste. I’m sticking with Jim Beam as my guess. Regardless of label and when tasted blind this is my least favorite by a small margin. Whiskey “C” has a slightly stronger aroma profile that seems to have two major components; ethanol-menthol and vanilla. On the tongue this is delightful. Starts with a nice hit of sweet vanilla and crème brulee. Then the oak and a hint of char show up. Finally, there is a gentle peppery rye finish. The profile comes and goes cleanly, but quickly and that’s what keeps this from being a crazy good bourbon – the flavor profile is compacted and a little stripped down. I wish this was barrel strength. My guess after a first taste is that this is the Evan Williams. Add a drop of water and it is honey & vanilla day at the donut shop. The flavor profile becomes sweet with a little bit of oak barrel in the background, and a very fast finish that leaves me thinking I want another sip. I’ll stick with my Evan Williams guess. Regardless of label, this is my favorite of the three. Whiskey C is Evan Williams. I am blown away! 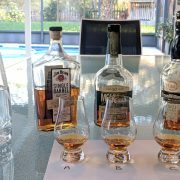 I’ve been drinking these three bourbons for a few weeks and thought I’d had the measure of them! I was CERTAIN that Whiskey B was Beam, and I was wrong. 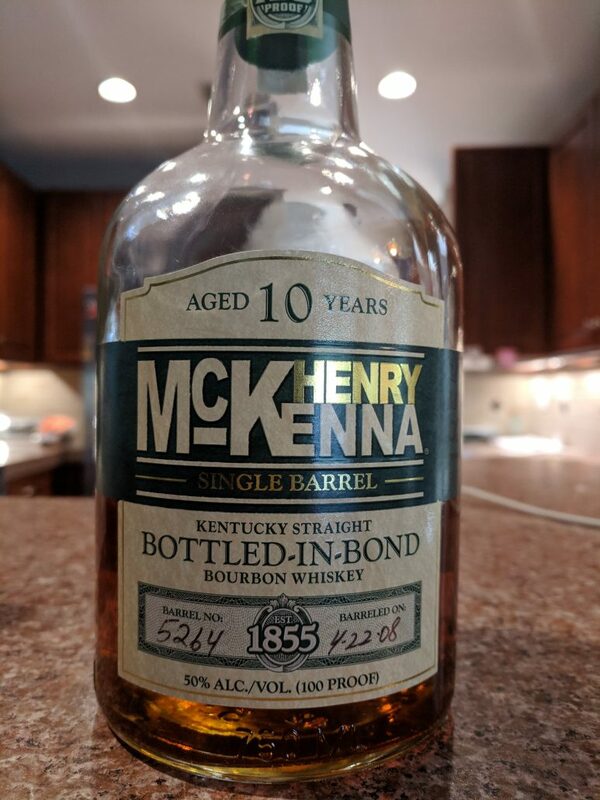 It’s my least favorite of the three when tasted blind, and it’s the Henry McKenna! And I really like the Henry McKenna! But here’s the thing… I still do. I probably won’t buy another bottle of this specific barrel, but I’m certain to try it again in the future. I’m just going to wait a few months before I do. I am really appreciating Whisky C, which is Evan Williams Single Barrel Vintage bourbon. It’s got everything an everyday drinker should exhibit – it tastes great and has essentially no fatal flaws. It goes down easy and doesn’t make me work to like it. It has been my favorite of the three since the beginning. Whiskey A is the Jim Beam and, in retrospect, I’ve clearly I’ve been looking for a reason not to like it. The blind tasting humbled me. 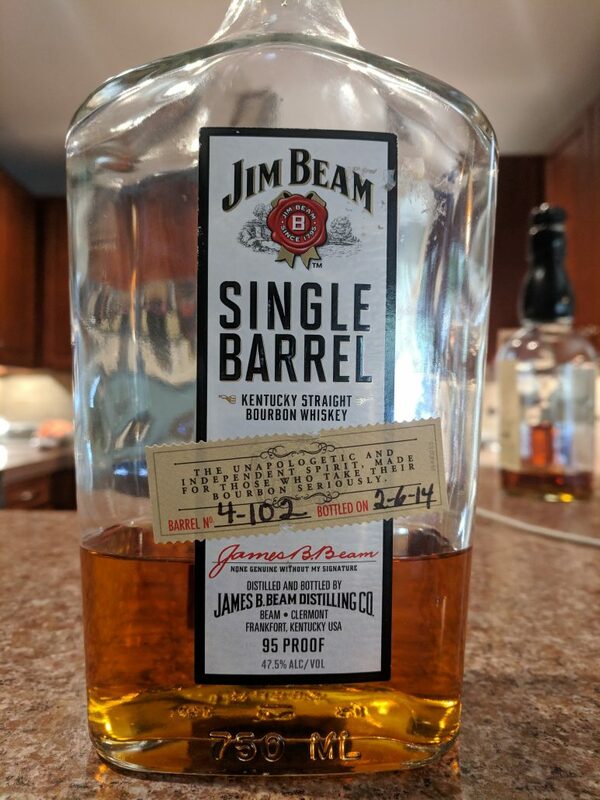 Jim Beam Single Barrel is a good bourbon and I think the rest of my bottle will happily find its way into tasty Manhattans and Boulevardiers. I really do like the Jim Beam Bottled-in-Bond, and I liked the Distiller’s Cut even more. Working from memory I can say I like both BiB and Distiller’s Cut more than I like the Single Barrel, which is a bit more expensive. I know, there’s no logic in this, it’s just how I feel about these bottles at this very moment. I can see that I’m going to have to do a Jim Beam shoot-out soon! What did we learn from this? First, a good single barrel bourbon can be had for under $30. With all the madness brought about by special editions, limited releases and a hot market that’s encouraging all manner of juice to hit the shelves at fantasy pricing its nice to have a quality option that is doing it the old-fashioned way – one barrel at a time. Another lesson we’ve learned from this is that labels can and do affect our perceptions of the contents more than they should. Most people don’t buy cereal because of taste; often it’s bought because of a cartoon character on the box. Voters don’t vote for a candidate because of that person’s professional experience, understanding of facts and figures, or demonstrated leadership skills. They vote for a contrived, artificial personality. And when it comes to liquor, marketing is no less critical. The bulk of the retail cost for most bourbons (or wine, or beer) is more about the appearance of the bottle and less about the liquid contents. Here are three fine whiskies, each of which is beating the odds and delivering a quality quaff for a very fair price. I’m glad I’ve tried them all and I’m confident I’ll find them in my rotation again. Joseph is a guest contributor to the Bourbon Sippers blog. He does an incredible job articulating his thoughts about whiskey and we’re thankful for his contribution. We hope you enjoyed this thorough review as much as we did! 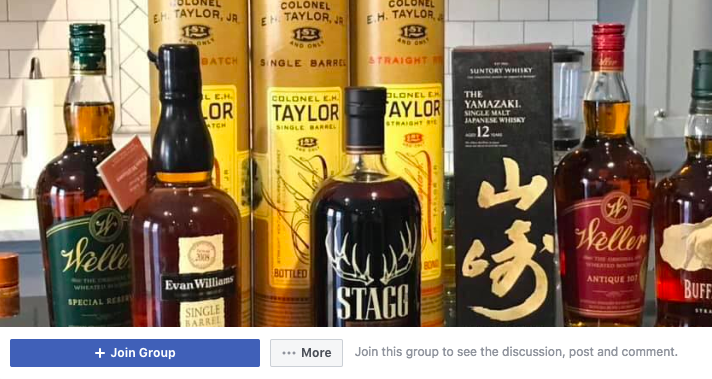 Join the Bourbon Sippers Facebook Group!